Henri Rousseau, born in 1844 was nicknamed “le douanier artist” due to his job at the customs offfice. This mundane job belied an active imagination and rich fantasy life that mainfested itself in Rouseau’s paintings. He painted as a hobby, and came to it late in life. It wasn’t until he was in his forties that Rousseau enjoyed an early retirement to devote himself to painting full time. As an untrained artist, he suffered immense ridicule from critics and artists alike for his naive style. This same innocence and charm eventually attracted the avant garde who appreciated his fresh and unpretentious vision. Rousseau is best known for his lush jungle scenes that he claimed were inspired from his military service in Mexico. Although he did serve in the military, Rousseau’s Mexican adventures were a product of his active imagination. The artist allegedly never left France. His depictions of exotic flowers and tigers battling buffalos were drawn from trips to the zoo and botanical gardens of Paris. 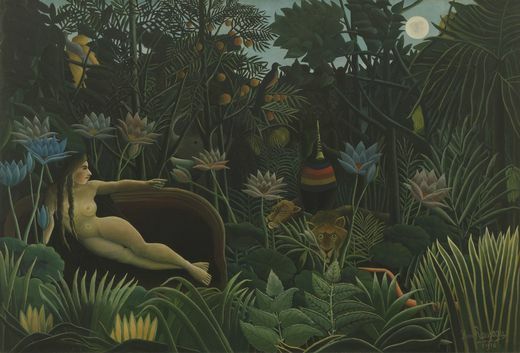 In the painting Dream, Rousseau depicted a wild green jungle in the midst of which sits a red chaise lounge with a naked woman lying on it. One wonders, did he claim to have witnessed such a scene in Mexico? I ardently hope so. 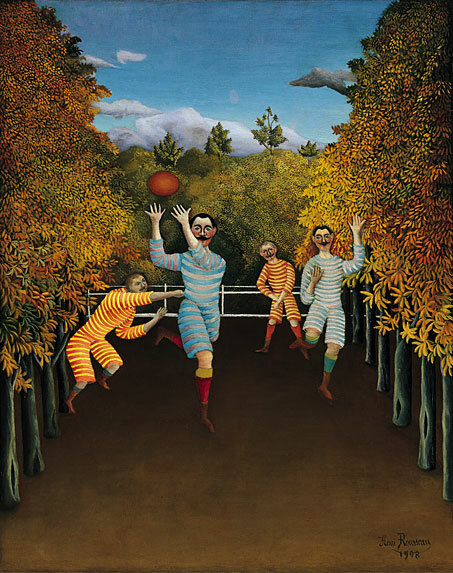 Another painting I love, The Football Players, depicts several mustachioed men playing rugby in what appears to be striped pajamas. I think I can honestly say it is the only painting that has ever made me laugh out loud. By all accounts Henri Rousseau was an eccentric man who crashed parties and gallery openings, and often took sarcastic remarks seriously. Although he did manage to show many of his paintings, Rousseau died a pauper. He was the archtypal starving and unappreciated artist who gained fame and recognition only after death.